The “3-in1” part is what should have caught your attention. 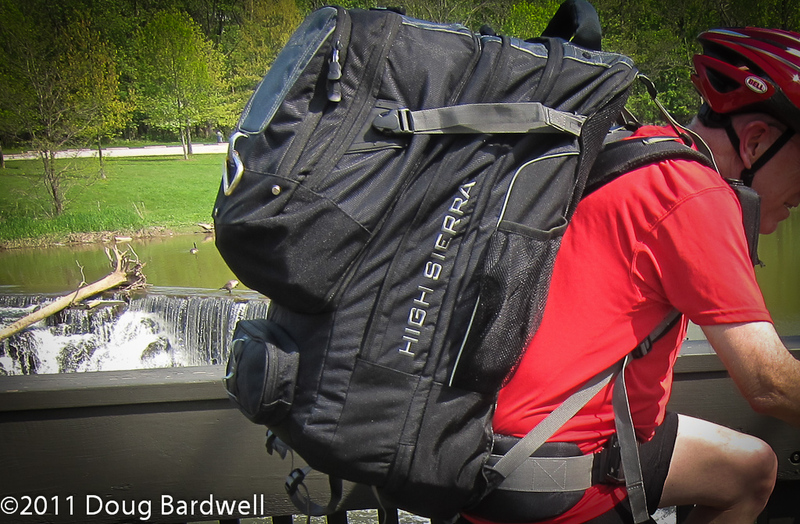 With the Compass backpack all zipped together, you have almost 4,300 cubic inches of storage. The main pack by itself is a roomy 3,295 cubic inches and the daypack by itself is another 976 cubic inches. It comes with a detachable shoulder strap as well, so you could even perhaps call it a 4-in-1. 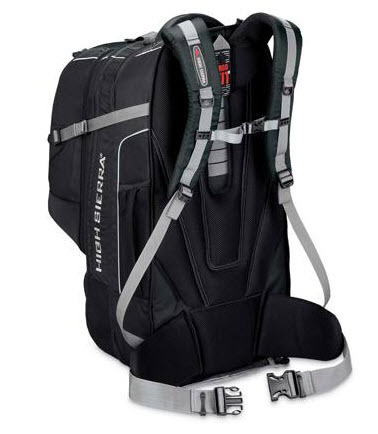 If you could only own one piece of travel luggage, the High Sierra TR103 Compass very well should be it. Versatility is its middle name Made from Duralite waffle-weave 1680-denier ballistic fabric, it comes with a limited lifetime warranty against defects of material or workmanship. At 6.8 pounds, with an internal frame, this travel pack should appeal to every traveler looking for that perfect blend of large storage capacity and single, easy to manage luggage. 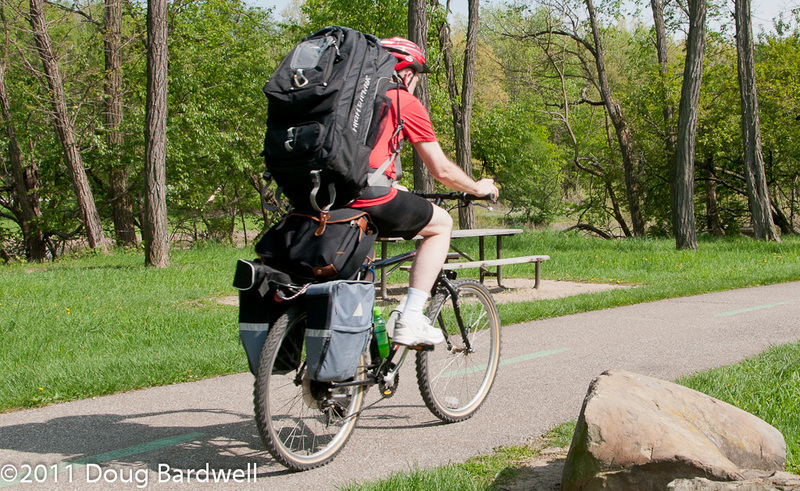 If your travels take you off the pavement, you know you need a backpack. If you want to carry a lot of gear to and from your destination, but only want a small pack while at your destination, this is just perfect. The daypack unzips easily, but while attached, the whole bundle only counts as one piece of luggage when you are checking in for your airline. Two compression straps on the main pack make sure it travels as one secure bundle and a concealed nylon cover pulls out to zipper close and tuck away the shoulder and waist straps while sending it though the airport check-in process. The main compartment is divided into two main sections, with a front load zipper as well as a hinged opening zipper for the lower section. A zipped fabric panel separates the two and makes it easy to reach through when hunting for that one “other” thing that’s always in the other compartment. The adjustable aluminum frame bars are concealed in this section and can be bent to fit the contour of your back. The padded shoulder harness is made of Vapel airflow mesh for moisture wicking and is fitted with their “Ergo-Fit” adjustment system. This enables you to adjust the height of the pack to be most comfortable based on your height and frame size. Load lifter straps offer even more adjustment by just simply giving them a pull until it feels right for you. The waist belt is also nicely padded with the same Vapel airflow mesh. Another outside large zipper reveals a shoe pocket at the lower end of the main compartment. The removable daypack comes with padded shoulder straps, so it can handle a sizable load itself and still be comfortable. It can also be detached from the main bag and worn in front of you for additional security if the situation warrants it. Two convenient clips attach it to the main bag’s should harness. The Compass’ daypack comes with a variety of organizational pockets. There’s one for your cellphone, while another zippered pocket handles your MP3 player with its headphone port. More sleeves and slots handle notebooks, pens and all your other miscellaneous. I spent an entire weekend recently, biking and hiking around Lake Erie’s islands while using this pack. I overloaded it with few clothes, but tons of photographic still and video gear. It easily swallowed my laptop, large travel tripod, two camera bags, a host of batteries and extra lenses as well as cellphone, GPS and MP3 player. I felt amazingly steady biking with such a large bag and it was easy to forget that I was even wearing it at times. With the variety of load points, it was easy to stop and get out just the gear I needed without having to unload everything else in the bag. That was the main advantage I appreciated when comparing this to most other large “top-load” backpacks. Check it out online at http://www.highsierrasport.com or at your local quality outdoor retailer. I think you’ll be impressed with all this bag offers for the price.